I think that it has been a while since I've taken some time to really relax and watch a good anime series. I'm serious. As the main anime writer on this blog, I feel like I've fallen short of living up to that "title". Rest assured though, I'm back in action once again. Yes...I'm pretty sure that has been said before and is extremely cliche, but bear with me. With that being said, I've figured that I'd just do a weekly blog about what i'm watching, thinking about, or other random stuff about anime. I know that it's be a while since my Beck post. Great series by the way. I recommend checking it out. You may not know this, but I'm a huge fan of an anime with an amazing soundtrack. You can see this in my liking of Beck and a personal favorite, Cowboy Bebop. In a recent post, I mentioned how much I loved Bebop and its music. It was this combination that changed my perception on what a good series is. In a way, I see this combination as evidence of the work of Shinichiro Watanabe (Bebop's dirctor) and Yoko Kanno (Bebop's musical composer). The series was genius! 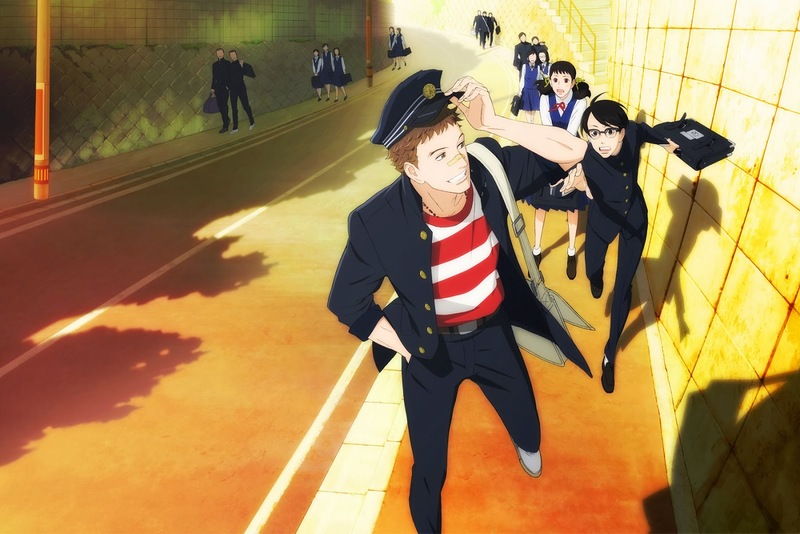 This lead me to wonder what Watanabe has been up to since Bebop (besides taking pics with me at Otakon 2013 lol), and I stumbled upon a recent series that he directed called, "Kids on The Slope". I'm about two episodes in and I must say that this series is pretty interesting. It takes place in the summer of 1966. The main character Kaoru Nishimi transfers to a new school and meets two new friends. One of these friends is Sentaro Kawabushi. He's described as being a thug, but he gives off more of an aloof gentle giant image to me. I only say this because this guy seems super deep into music; jazz in particular. Some of the opening scenes of the anime are of him drumming on the railings while walking through school, and later followed by this guy drumming on a drum set in the basement of his childhood friend Ritsuko. Apparently her family runs a record store. With Sentaro into drumming out jazz music, Kaoru cannot be left behind. Kaoru talent lays in playing the piano. He says in the series that he has been playing classical music on the piano since he was a child. He's pretty good too. He learns about Sentaro's passion for jazz and competitively wants to learn about jazz as well. With this going on, I must admit that I'm liking the potential that this series has. I foresee some great music in my future. He's to hoping for a great series!